Wendell Oliver Belfield, Sr., DVM (Doctor of Veterinary Medicine) passed away peacefully, on August 10, 2018, at his home in San Jose, California. He was born in New Orleans, Louisiana, on September 14, 1928, to the late Mr. and Mrs. Clifford L. Belfield, Sr.
Wendell married Marlene Bigard in 1954, who preceded him in death in March 1996. Wendell attended Valena C. Jones Elementary School, Xavier University Preparatory School, and graduated from McDonough 35 High School in New Orleans, Louisiana. He completed three years in pharmacy school at Xavier University of Louisiana. While there he was on the track team, successfully running the 100-yard dash in major college track meets. Wendell transferred to Dillard University in New Orleans, Louisiana, and successfully completed courses needed to enter the veterinary medical school of the Tuskegee Institute in 1950. Wendell was awarded the degree of Doctor of Veterinary Medicine (DVM) in 1954. He then accepted a veterinary meat inspection position in Portland, Oregon. He did not like Portland, and moved to Escondido, California, where he worked as a veterinary meat inspector for the state of California. While there, he married Marlene Bigard, and they moved to Marlene’s home, New York City. Again Wendell worked as a veterinary meat inspector until he entered the United States Air Force as an officer in charge of food inspection. After discharge from the air force, Wendell and Marlene moved to San Francisco, California. He again worked as a veterinary meat inspector until they settled in San Jose, California. 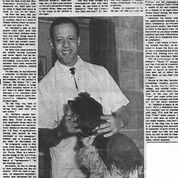 Dr. Wendell O. Belfield, Sr. opened his veterinary practice, “Belmar Veterinary Hospital,” in 1962, in San Jose, California. Wendell and Marlene had two children: Wendell O. Belfield, Jr., born August 30, 1955, in New York City, and Suzan Belfield, born November 1, 1957, in Rome, New York. Dr. Belfield’s veterinary practice was successful, and included treatment of police department dogs. He also started his successful orthomolecular medicine business, providing medicine for pets. Dr. Belfield was also the author of the book “How to Have a Healthier Dog” (1981), “Very Healthy Cat Book” (1983) and veterinary medical articles that were published in journals and magazines in the United States and foreign countries. He also wrote a chapter included in a veterinary textbook, "Alternative Veterinary Medicine. Dr. Belfield was also a pioneer in promoting wholesome dog and cat food. His advice to a client led to the starting of their own dog food business "Natura Pet Food." He served as their consultant and they named the quality laboratory of their Natura Pet Food plant in Fremont, Nebraska, after him. When the Natura pet food company was sold to a larger pet food company, Dr. Belfield did not want his name used and had it removed. Dr. Belfield is survived by two siblings: Dr. Clifford L. Belfield, Jr. and Dr. Irving E. Belfield his son, Wendell O. Belfield, Jr.; his daughter Suzan Belfield; grandsons Alexander, Adam and Andrew Belfield and Derek and Brandon Hagen; granddaughters Brianna, Tyler Hagen and Bridget Belfield; and three great grand children. Dr. Belfield is also survived by niece Althea Belfield Carter and nephew Dr. Winthrop B. Carter.